Democratic lawmakers on the House Intelligence Committee are asking Twitter to provide more information about a suspicious account that reportedly pushed a viral video about the incident Friday between high school students and American-Indian activists. 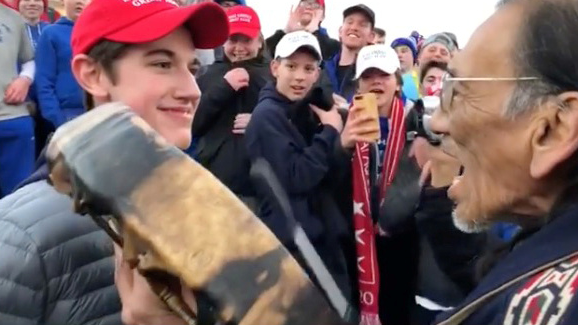 Twitter suspended an account called @2020fight that posted a caption and a minute-long video of the confrontation between the Covington High School students and American-Indian activists. Democratic Sen. Mark Warner of Virginia told The Huffington Post Wednesday his office contacted Twitter regarding the video. Democrats are worried the viral video might be a harbinger for things to come, especially as the party prepares for the 2020 presidential election. Russian operatives through a company called the Internet Research Agency spread messages through YouTube, Reddit, Tumblr, Pinterest, Vine and Google+, along with Facebook and Twitter to rile up tensions between Americans prior to the 2016 election. The black community was targeted “extensively with dozens” of Facebook pages and Instagram post. There is disagreement about the degree with which the ads swayed opinion during that election. Most of the ads did not focus exclusively on then-Republican presidential nominee Donald Trump or then-Democratic presidential candidate Hillary Clinton, and the ad sales amounted to a mere $100,000. It was a paltry sum during a campaign where both sides spent tens of millions of dollars. Democratic operatives were also reportedly behind a similar ploy during Alabama’s 2017 special election. A handful of Obama-era officials allegedly helped create thousands of Twitter accounts posing as Russian bots in order to boost Democratic Alabama Sen. Doug Jones in the December 2017 special election by linking his Republican opponent, Roy Moore, to Russian influence campaigns.